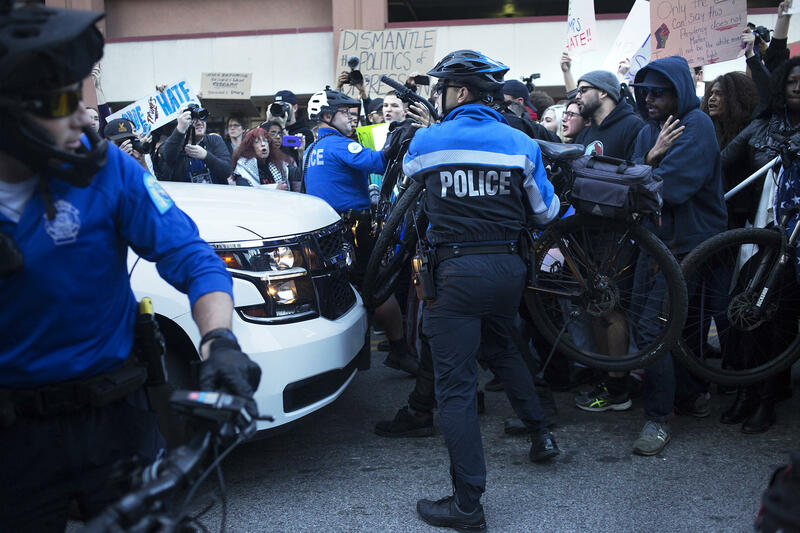 St. Louis Metro Police officers use bicycles to push back protesters at a rally in November 2016. State Sen. Jamilah Nasheed was in favor of Prop A, noting “if we want to bridge the gap between law enforcement and the community, this is the best way." Supporters of the measure, which included Democrats and GOP financier Rex Sinquefield, said it was necessary in light of a 2016 audit that found Sharon Carpenter, the current recorder of deeds, had inadequate bookkeeping, and appeared to misspend some money. They also believed it could help the police department help pay for body cameras, which will cost several million dollars.The office’s budget was about $2.8 million annually, with 80 percent of that going toward salaries. But Carpenter said only about $100,000 would have been available for cameras because her staffers would have to be given other city jobs under state law. Carpenter, who has held the office for 37 years, said she felt her office was targeted because it would make it easier to eventually merge with St. Louis County. She also believed it might be unconstitutional to put two different issues on a ballot measure. The Recorder of Deeds office retains all official records for land transactions, births, marriage and other things in the city.